Select Heat/Cool mode with an easy to use switch. 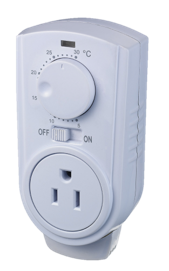 Easy to operate and simple plugs into a standard socket for DIY installation. Select the desired comfortable temperature by a temperature selection dial. Temperature range: 5 - 30°C or 40 - 85°F. Temperature accuracy: +/-1°C ro +/-3°. Designed with a highly accurate negative temperature coefficient sensor with high performance electronic control circuit to provide a very accurate temperature switching control.